The Cherry Shrimp is one of the most popular invertebrate around. Native to Taiwan they come in various shades of red and are in fact graded (more on this later). Its vibrant color, and ease to keep, makes it very popular in particular for beginner aquarists. Free eBook: Grab your Cherry Shrimp guide now and learn all there is to know about caring for these invertebrates. The Cherry Shrimp (Neocaridina heteropoda), also known as Red Cherry Shrimp or RCS, is a dwarf freshwater shrimp native to Taiwan. It belongs to the Atyidae family of invertebrates, of which there are more than 20 other varieties of Shrimp. It is a freshwater Shrimp that is incredibly peaceful and renowned for its algae eating capabilities. Suitable for both beginners and experienced aquarists, it is one of the hardiest and easy to keep Shrimp available. 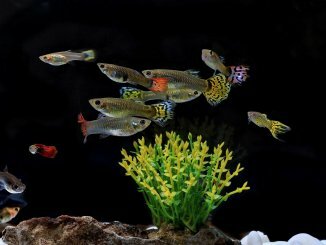 They will add color into any tank which they are placed in and are very undemanding requiring very little upkeep. Interestingly in the wild they come in a variety of colors, however in the aquarium trade you will generally only find them in red. Their deep red is due to years of selective breed; in fact they are now graded depending on the shade and depth of red (more on this later). This invertebrate is very hardy and will survive in nearly all freshwater aquarium setups. It will thrive in heavily planted setups with lots of shelter and hiding spots. You should expect your Cherry Shrimp to live between one to two years. They are known for their peaceful and non-aggressive behavior. If you watch them you will see that they spend large periods of their day grazing on whatever is in your aquarium; plants, moss, substrate etc. They are very active and will be busy during the day and night. Females will typically grow up to 1.5 inches long, with the males being slightly shorter. 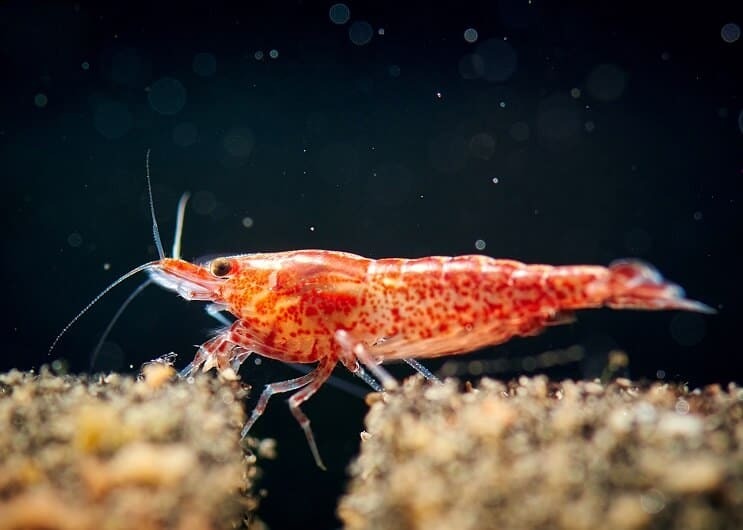 Without a doubt the most important part of their appearance is their color; in fact Cherry Shrimp are actually graded. The grading can range from the deepest red through to paler colors with red spots. Cherry Shrimp:These are known as regular cherry shrimp and are the lowest grade of Neocaridina heteropoda They tend to be mainly clear in color with red patches. Sakura Cherry Shrimp:These are slight more red in color but still have clear patches on their body. Fire Red Shrimp:At this grade the shrimp is completely red. Painted Fire Red Shrimp:These are the most expensive and highest grade. They are solid deep red in color with no transparent areas. You will also find they typically have red legs. Regardless of their grading, females will always be more colorful and larger. As young Shrimp it isn’t possible to tell the difference between the males and females however as females mature they will develop a saddle on their stomach; this can be orange in color and is used to hold her eggs before they are fertilized. In the wild Neocaridina heteropoda, originate from Taiwan. They live in streams and ponds surrounded by densely packed plants and a rocky substrate. So for your aquarium you should try to emulate their natural conditions in the wild as closely as possible. They thrive in densely planted aquariums that have lots of hiding crevices and moss; you can also include some driftwood in the tank as they will nibble the algae from it. They will also eat the plant matter debris which can make up a reasonable part of their diet. Moss is needed in the aquarium as they will groom themselves and hide within in; you can use java moss. Remember when your shrimp feels safest they will present themselves with the brightest coloration. In terms of substrate you can use small pebbles to replicate the rocky substrate which they are used to. For equipment, generally a heater isn’t needed. If you want to keep the water temperature very stable then you can always add a heater, but provided the room you keep the aquarium in is heated it generally isn’t needed. Now onto perhaps the most controversial piece of equipment when keeping Shrimp; filters! A common problem with filters is that they are too powerful and your Shrimp can be sucked into them. You can prevent this by using a sponge filter. Or if you’re using a more powerful filter, such as a canister, you can use the inlets with foam to reduce the flow. Just make sure that your filters aren’t sucking your Shrimps up! If you still want to oxygenate the water and are worried about less filtration you can always use an air stone. Now onto ideal water conditions for your inverts. Generally the lower grade shrimps can tolerate poorer water conditions. However the higher grade shrimps need better water conditions. The pH level should be between 6.5-8.0, and you should maintain a temperature between 65-85 °F. Just as a reminder though, you should not place them in an un-cycled tank because they are very sensitive to nitrites. Cherry Shrimps can be kept in aquariums as small as 5 gallons. However the size you will need depends on the number you intend to keep. As a good rule of thumb you can add 2-5 Shrimp per gallon. Just remember though that they will breed quickly so make sure to get an aquarium that is slightly too big rather than too small. If you’re intending to have a colony, make sure you have at least a 20 gallon tank. Like other shrimps, Cherry Shrimps are very peaceful inverts. It’s safe to say they will never hurt other fish as they don’t have any real way to defend themselves. This is why it’s very important to choose their tank mates carefully. With little to no defense capabilities, your shrimp can quickly turn into food for other fish. As a good rule of thumb, higher grade shrimp should be placed in a single species aquarium (more on this later). Whereas lower grade shrimp, can be placed with other tank mates. Generally they will breed fast enough to offset against the occasional casualties. Remember even with the fish mentioned above, occasionally your Cherry Shrimps might be mistaken as food. 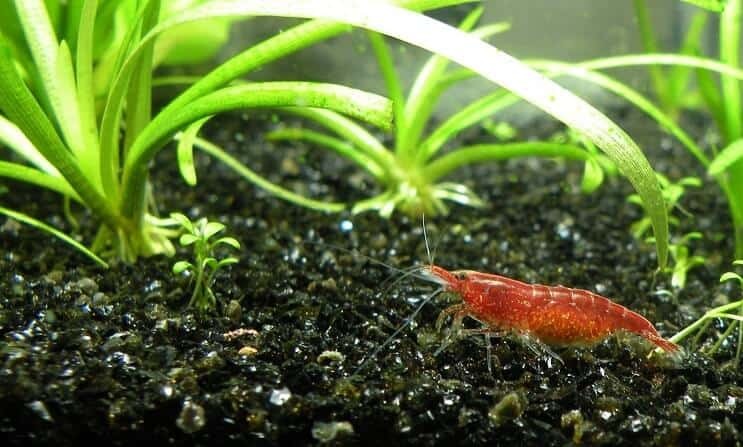 To provide more security to your Shrimps you should make sure your aquarium has lots of plants and hiding spaces. For a rule, don’t place any predatory fish or large species within the same tank. It is not recommend you keep a cherry shrimp on their own, the most popular way to keep Cherry Shrimp is in a species only aquarium. When keeping them together it is recommended that you keep at least 10; this will help limit dominant behavior. Also the larger the group the more confidence they will have and you will get to see their more natural behavior. As for stocking your tank, you should add 2-5 Shrimp per gallon. You can’t really overstock with them as their bio-load is almost non-existent. In terms of male to female ratio, they are fantastic to breed so you don’t need to worry about this too much; just ensure more females than males. If you want to add some variety to your tank you can also add other shrimp and snails. Shrimps such as the Ghost Shrimp, Vampire Shrimp or Amano Shrimp, will be a good match. In the wild, Shrimps are scavengers and will eat pretty much anything they come across. They are Omnivores, so will eat both meat and plant matter; this will typically take the form of algae and other tiny organisms (more on this later). Due to their scavenger nature it means feeding them is fairly straight forward as they aren’t fussy. As always we recommend that a high-quality pellet makes up the core of their diet. 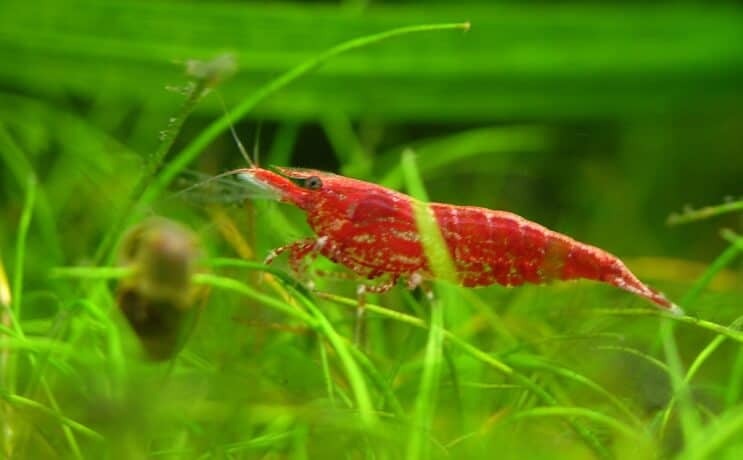 You will find several brands that make feed specifically for Shrimps and Invertebrates. In addition to this you can supplement their diet with frozen foods and vegetables. If you are planning on feeding them vegetables, make sure they are boiled and blanched first. Ideal veggies include: Spinach, Carrots, Lettuce, Cucumber and Zucchini. Remember they are tiny and don’t require lots of food; it’s very easy to over feed them and pollute your tank. Now as mentioned above they are scavengers and have a reputation of being algae eaters. In fact we mentioned them in our 13 Must Have Algae Eaters. 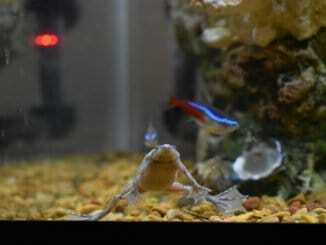 They will eat most types of algae found in an aquarium, and make an excellent cleanup crew. Whilst they don’t consumer as much algae as large fish, they will play a part in keeping your aquarium glass clean. Finally, just as a reminder, when feeding them make sure to remove any excess feed from the tank to maintain your water chemistry. You should remove the feed within 2 hours after eating. As previously mentioned, on the whole this invertebrate is very undemanding in terms of its care requirements. However one thing you should be aware of is they are incredibly sensitive to copper. Copper can be found in lots of medication and fish feed so always check the label. Also periodically, as they grow, they will shed their exoskeleton. It’s important you leave this exoskeleton inside the tank as they will consume this to restock on essential minerals. Finally the last thing you need to know about caring for them is that they are also very sensitive to ammonia spikes. So you should ensure you water parameters stay stable at all times. The larger your aquarium the easier it is going to be for you to maintain this. If you want to breed Cherry Shrimp you’re in luck. They are one of the easiest shrimp species to breed. The first step is preparing the aquarium for them so they can breed. You can do this by making sure the aquarium is heavily planted; this will provide security and comfort to the Shrimp. Next you need to make sure they are regularly feed with high protein foods. 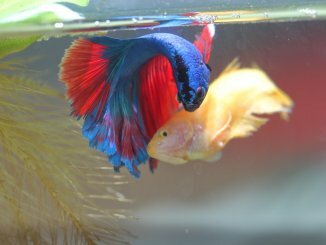 Finally, you should raise the water temperature up to 82°F (this will replicate the start of summer; their breeding season). You should expect sexually matured Shrimps (4-6 months old) to start breeding once they have settled in an aquarium; this typically takes 3-5 months. Once they have mated it will be obvious, because when you look at the female you will see lots of eggs underneath her tail. When she is carrying the eggs it is referred to as “berried”. You will see her fanning her tail during this time to make sure the eggs receive oxygen. It will take around 30 days for the eggs to hatch. You will see the baby shrimps look near identical to their parents except much smaller! They should be kept in a matured aquarium as a newly cycled aquarium will not contain the minute organisms that the baby shrimps rely on to eat. If you’re worried they don’t have enough to eat you can plant something with leaves they can eat; Anacharis are a good example. You will also notice during this stage the adults don’t make good parents. They will leave the baby Shrimp to fend for themselves. We hope you’ve found this ultimate guide to the Cherry Shrimp helpful. They are a fantastic Shrimp that will add color and interest to any freshwater aquarium. Their hardy nature makes them ideal for beginners who are looking to branch out from just keeping fish. I added two tiny Cherry shrimp to my 20 gallon aquarium with 5 neon tetras, 4 platters, a dwarf gourami a pleco, and two small German rams. At first they hung out in the grass at bottom, an hour later were climbing tall plants, And no I haven’t seen them since yesterday. Are they hiding or do you think they got eaten there quickly? I do have a dragon rock with a ton of holes and other hiding laces but I thought they would still pop out here and there. Thanks! Thanks this is really helpful. I bought my first cherry shrimp last Sunday, he is in with 2 penguin tetras, 2 guppies, 2 mollies, and 2 little wood shrimp. I think I might have to get him a friend. My wood shrimp are always out and about, busily cleaning up the tank, but the cherry shrimp likes to hide away. I have lots of plants, driftwood, moss etc in the tank so hopefully he is enjoying it. It’s wonderful to see him swim. Hi Lizzy, thanks for sharing your experience with us. I’m glad you found the article helpful. Thanks, Robert.